With most of 2013 gone, we are in a fortunate position where once again we have shown growth. This year we are on target for over 17% growth, thanks to you our faithful clients. The experiment we started in 2009 to try and source more coffees from estates, we believe has afforded us the opportunity to offer some great coffees. So in the newsletter we will have a quick summary of the coffees landed and available, then discuss the new coffees coming and give details on our open day 2 November 2013. Sertãozinho from Brazil. This is the first pulp natural yellow bourbon we have done, and we love it. Subtle fruit and rich body make it excellent in almost any coffee preparation. We have already gone through 1.5 bags in the first 3 weeks, and only bought in 21, so we expect it will go soon. Read more about it here: Brazilian yellow bourbon. 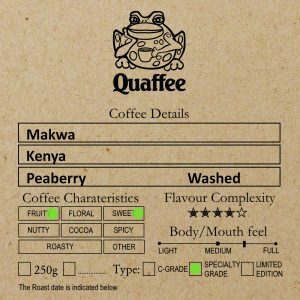 The other coffee we have been able to source is through a new South African importer called Bespoke. They work with one of the large coffee export import companies. This company has been given access to small lots of estate coffees and Kiamabara comes from them, it offers great value and has great deep mocha and chocolate tastes. We all have families and things to do on weekends, but we have had a number of requests for an open day. We have decided to have our next open day on the second of November at Buitenverwachting. It will be from 09:30 until 12:30, and we will have at least 3 coffees to taste, and will be doing brewing demonstrations of various brew techniques. We will post this event on our facebook site in the coming week. Thanks once again for reading the newsletter and your fantastic support, we look forward to hearing and seeing more of you.